"I had a ball making this new record and working with Steve Jordan and Waddy Wachtel again," says Richards. "There's nothing like walking into a studio and having absolutely no idea what you’re going to come out with on the other end. If you're looking for 'Trouble,' you've come to the right place." 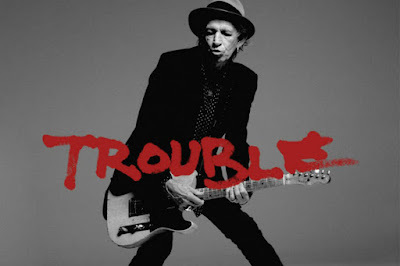 The trio were rounded out by Rolling Stones backup singer Bernard Fowler, keyboardist Ivan Neville and singer Sarah Dash, alongside special guests including Norah Jones, Spooner Oldham, multi-instrumentalist Larry Campbell and Aaron Neville, while a pair of songs feature contributions from late Stones saxophonist Bobby Keys, who passed away last December at the age of 70. The guitarist recently revealed the possibility of doing some solo dates behind the project. Richards and The Rolling Stones are currently playing shows on their Zip Code North American stadium tour.